If protecting the user and productivity are your #1 concern, Easy-Cut 2000 is the box cutter for you! 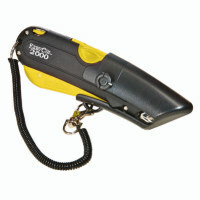 Easy-Cut 2000 has the same benefits and safety features as the Easy-Cut 1000, but several new design enhancements have also been added to this safety knife. Features include the patented radius-blunt tip blade and multiple blade-depth settings, ergonomic handle that extends and retracts the blade naturally, unique snap-on lanyard to prevent lost-cutters, and on-board blade storage. In additon, a slight increase in the blade length was added to accommodate imported boxes that may be damaged or more difficult to cut. A tape splitter was also built into the end of the knife to allow quick-action tape cuts that don’t require a sharpened blade. In addition, since this knife was intended primarily for top cuts, the edge guide automatically deploys when the cutter is removed from the holster – instantly setting the knife into motion for work to begin! This is our most popular Easy Cut worldwide! It has the tape splitter that you won’t find on the 1000 or 1500 models and the automatic edge guide arming device for top cuts. Note: Prices shown exclude GST, online ordering via this website is for New Zealand based customers only. Contact us for bulk pricing.